Summertime. Hot weather. Sunny days. Blue skies. Relaxing with friends. Fresh, juicy fruits. Sitting by the water. Sipping chilled drinks. And do I have one of the best chilled drinks for you. 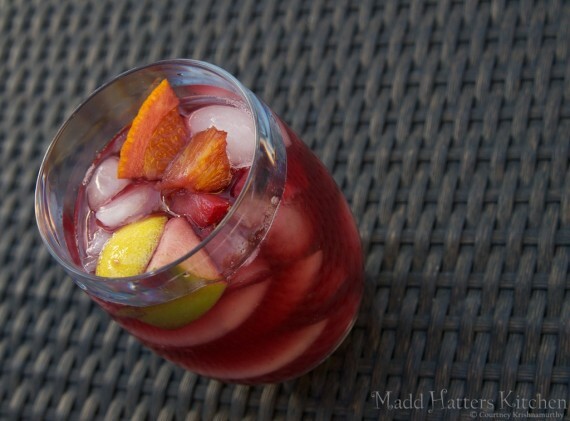 The classic sangria. You can whip it up by the pitcher or by the cooler, depending on how big your crowd is. Sit out glasses and an ice bucket, as well as a ladle for the fruit, and you’ve got a self-serve cocktail that packs enough of a punch to enjoy, but not so much that your friends will be teeter-tottering into the pool. 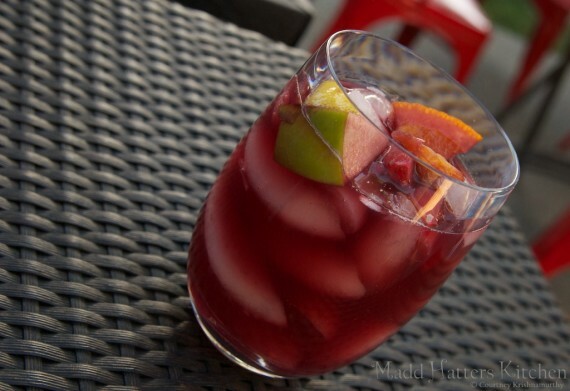 The wonderful thing about sangria is there are so many options, and you can make do with whatever you have on hand. Red, white, rosé, sparkling – all make a wonderful sangria. Pick your fruit, pick your juice, pick your liqueur, and pick your soda. Balance it out with a little pre-punchbowl taste test, adding a bit more of this or that to bring a harmony to the flavors – not too sweet, not too fruity, not too alcoholic, but Goldilock’s-approved ‘just right’. This Goldilock’s has already found her ‘just right’ however for the classic red wine sangria, so she shall share her secrets with you forthwith. Mix it up, share it with friends, and enjoy the summer months, as they will be gone before you know it. In a 2 quart pitcher, add the cubed fruit, Cointreau, brandy, and cherry pomegranate juice. Stir well and let sit for at least 30 minutes or up to 2 hours. Add the wine and flavored sodas and stir well. Add 4 ounces of the soda water and taste. Add more soda water if needed. If you scale the recipe up, always start with the minimal amount of soda water and add extra to taste. Serve over ice, ensuring each glass gets a good amount of the marinated fruit.